For those who like a good story based on real life with some terrific songs and acting, the Blu-ray is definitely something to purchase so it can be enjoyed time and time again! It's always a little tricky when a hit Broadway Musical is adapted for the big screen. Devoted fans of the show often scrutinize every detail and compare the movie to the stage productions. In the case of Jersey Boys, I don't think the fans will be disappointed. Coming to Blu-ray and DVD on November 11, 2014, it packs all the excitement, emotion and amazing music of the Broadway show. 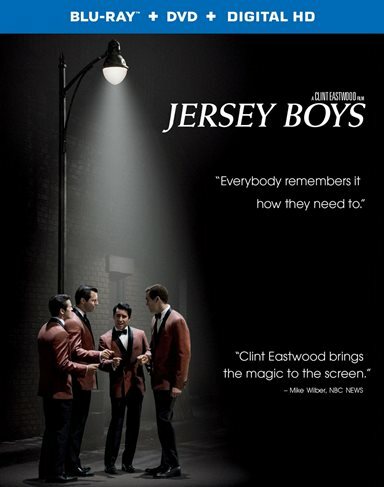 Directed by Clint Eastwood (Gran Torino, Million Dollar Baby ), Jersey boys stars John Lloyd Young (Glee) as Frankie Valli, Erich Bergen (Gossip Girls) as Bobby Gaudio, Michael Lomenda as Nick Massi and Vincent Piazza (Boardwalk Empire) as Tommy DeVito. The first three reprise their roles from the stage production with the latter one new to the script. Christopher Walken (Hairspray, Catch Me If You Can) also joins the cast as GypDeCarlo. Jersey Boys loosely tells the story of Frankie Valli and the Four Season and how they went form singing in small night clubs and bowling alleys to being a huge recording act. As will all good "rise to fame" stories, Jersey Boys includes guys from the wrong side of the tracks, conflict within the group, trouble with the law and the mob and disastrous personal lives. Of course no "behind the music" would be complete without tragedy, in this case, the death of Frankie Valli's oldest daughter. While the basic premise is true, the writers took "poetic license" with some of the finer details. The cast is superb especially John Lloyd Young as Valli. He portrays Valli with nice guy, slightly naïve charm while singing the songs with a beautiful voice. The supporting cast is terrific including Bergen, Lomenda, and Piazza. Walken is great as always and Renee Marino and Erica Piccininni (Wilderness) as Valli's ex-wife and girlfriend respectively hold their own in this ensemble. Also noteworthy is Donnie Kehr (Chaplin) as Norm Waxman, who originated the role on Broadway. The story itself is engaging and entertaining and Eastwood's Direction moves the movie along at a nice pace. The music is as fun and enjoyable as older audiences will remember it. Presented in DTS-HD Master Audio 5.1, the quality enhances the viewer's listening experience and the 1080p video shows every scene clearly. The Blu-ray extras include 3 different segments. The first discusses the path from the show's concept, to Broadway and ultimately to the big screen. The second segment called "to good to be true" shows the Broadway stars discussing their "pinch me moments" of being cast in the movie version and working with Walken and Eastwood. The last piece walks the viewer through the concept and rehearsals of the final musical number. All three parts are interesting and worth watching. Download Jersey Boys from the iTunes Store in Digial HD. For more information about Jersey Boys visit the FlickDirect Movie Database.